Tommy Robson at the ABAX Stadium. Peterborough United are to honour club legend Tommy Robson’s 50 years at the football club. Robson joined the club in 1968 as a player and has never really left, He still works for Posh as a matchday host. Tommy Robson in action for Posh. Prominent Posh fan Adi Mowles, the chairman of the Peterborough United Independent Supporters Association (PISA) who led the fund-raising effort for the Chris Turner statue at the ABAX Stadium, has agreed to be involved in the organisation of any Robson tributes. Here he pays his own tribute to his first Posh hero. “There are many reasons to have heroes and when it come to Posh each generation (just about) has had their own. I started going to london Road in the 1972/723 season which was a truly awful season to begin my love affair, but beggars can’t be choosers I suppose. Posh fan Adi Mowles with a tribute to Chris Turner at the ABAX Stadium. History shows of course that the squad assembled wasn’t as bad as the results of that season show and Noel Cantwell made them world beaters the following season. Well I say world beaters when I actually meant the likes of Scunthorpe, Newport, Doncaster, Gillingham and of course the enemy down the Nene. My hero was chosen for me in that season. I had obviously noticed Tommy Robson on first sight. Him flying down the wing was a sight to behold and his partnership with Jim Hall and John Cozens always promised a lot without really delivering in the first campaign I witnessed. My man was on fire that Fourth Division winning campaign (amazingly the last time we have won the league!) and so were his strike partners. 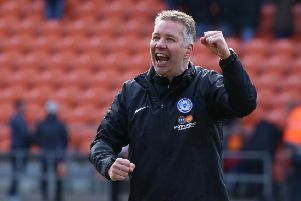 Yes, boys and girls Posh played with at least three up front back in the olden days with Cozens scoring 25 goals and Jim Hall, for him, having a reasonably quiet season with 14 but his game was more than just scoring, and even Robbo chipped in with 11. Watching Tommy (he’d not been knighted back then) I never guessed I would end up not only knowing the bloke well, but would be also honoured to class him as a mate a few decades ahead. Footballers back then didn’t make the money even their lower division counterparts make nowadays and whilst Sir Tommy has never complained it is a great shame that him and his teammates, although still ever popular around town, all had to work after their playing careers finished which is not always the case even for footballers of our level. Amazingly come October this year it will be 50 years since Sir Tommy first came to our football club. Since retiring in 1981 after a record never to be beaten of 559 appearances for the club Tommy has regularly been seen at London Road doing a massive variety of jobs from youth team coaching to being the face of the football club he so loves showing fans around the stadium and hosting match day sponsors. No-one I have ever met has ever had a bad word to say about the man with the exception of quite a few right backs who have suffered with hernia issues into their dotage after trying to kick Tommy into touch all those years ago. Heroes are often a disappointment when you meet them.